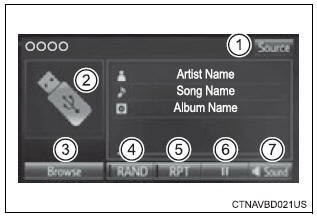 Connecting a usb memory device enables you to enjoy music from the vehicle speakers. Touch �usb� on the audio source selection screen. Touch the cover art display. ?Depending on the usb memory device that is connected to the system, the device itself may not be operable and certain functions may not be available. If the device is inoperable or a function is unavailable due to a malfunction (as opposed to a system specification), disconnecting the device and reconnecting it may resolve the problem. If the usb memory device still does not begin operation after being disconnected and reconnected, format the memory. �Connection error. Please consult your owner�s manual for instructions on how to connect the usb device.� This indicates a problem with the usb memory device or its connection. �There are no files available for playback. Please add compatible files to your usb device.� This indicates that no mp3/wma/aac files are included on the usb memory device. Compatible devices usb memory device that can be used for mp3, wma and aac playback. Correspondence class: mass storage class mp3, wma and aac files written to a device with any format other than those listed above may not play correctly, and their file names and folder names may not be displayed correctly. Mp3 (mpeg audio layer 3) is a standard audio compression format. Files can be compressed to approximately 1/10 of their original size using mp3 compression. Wma (windows media audio) is a microsoft audio compression format. This format compresses audio data to a size smaller than that of the mp3 format. When a device containing mp3, wma and aac files is connected, all files in the usb memory device are checked. Once the file check is finished, the first mp3, wma and aac file is played. To make the file check finish more quickly, we recommend that you do not include any files other than mp3, wma and aac files or create any unnecessary folders. When a usb memory device is connected and the audio source is changed to usb memory mode, the usb memory device will start playing the first file in the first folder. If the same device is removed and reconnected (and the con- tents have not been changed), the usb memory device will resume play from the same point in which it was last used. If the file extensions .Mp3, .Wma and .M4a are used for files other than mp3, wma and aac files, they will be skipped (not played). Do not connect a usb memory device or operate the device controls. Do not leave the usb memory device in the vehicle. The temperature inside the vehicle may become high, resulting in damage to the usb memory device. Do not push down on or apply unnecessary pressure to the usb memory device while it is connected.